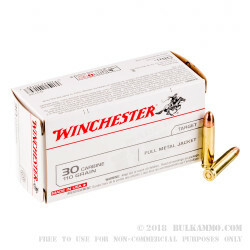 This 30 Carbine cartridge by Winchester offers a 110 grain full metal jacket projectile. 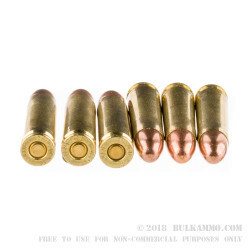 The bullet’s jacket makes it ideal for target shooting, as it will prevent the accumulation of lead residue in your weapon’s bore so you can fire with better accuracy for longer in between cleanings. Its jacket facilitates feeding in semi-automatic weapons as well. Billed as ideal for shooters of all levels, this round has a fast muzzle velocity of 1,990 fps that will help you close the gap between you and your target fast. Winchester’s well-known “USA White Box” stands for over 150 years of the company’s commitment to consistent performance and outstanding value. 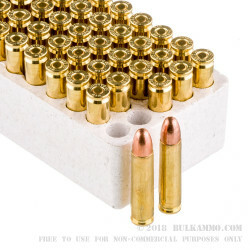 Whether you would chamber this round in a classic M1 carbine, an AMT AutoMag III, or a Ruger Blackhawk, you’re certain to approve of the quality cartridge’s performance.